The characters and settings in Walt Disney’s new FROZEN look like they exist in the same world as those in TANGLED. Where TANGLED re-imagined the Brothers Grimms’ hair-challenged Rapunzel for modern audiences, FROZEN borrows from an 1845 Hans Christian Anderson fairy tale, working a similarly charming magic on the big-screen (and employing another one-word adjective for a title that has a better ring than its original “Snow Queen”). The animation styles applied to the cartoon constituents of chilly Arendale so closely resemble those used for Rapunzel and Flynn Rider that the medieval men and women (and animals) from both films could be considered computer-generated cousins. But this time out, kiddies get to meet not just one new Disney Princess, but two. Elsa (Idina Menzel) and Anna (Kristen Bell) are happy sisters living with their parents in the royal Arendale castle. But when Elsa accidentally zaps and injures the younger Anna with her cryo-kinetic freeze power at playtime, mom and dad sequester their daughters in separate chambers, where the girls spend the better part of the next decade: They have no contact beyond singing forlornly to one another through their doors. That changes when the king and queen are lost at sea and Elsa inherits the crown. The separated sisters initially get on well when they’re reunited on coronation day, but the blonde queen—remembering her past transgression—distances herself emotionally from auburn-headed Princess Anna. The relationship sours when impulsive Anna announces her engagement to Prince Hans (Santino Fontana), whom she meets that very day at Elsa’s party. Elsa thinks it’s a ridiculous idea and withholds her blessing, angering Anna. The stubborn sisters have a nasty falling out and—in her rage—Elsa plunges the typically temperate Arendale into a perpetual winter. Shocked, the castle guests chase the new queen out of town like Frankenstein’s monster. But Anna realizes only Elsa can reverse the curse and sets out into the snowy wilderness after her, leaving Prince Hans in charge of things back home. Anna crosses paths with hunky ice transporter Kristoff (Jonathan Groff) and his carrot-chomping reindeer companion Sven, who serve as this film’s analogs to TANGLED’s Flynn and his horse, Maximus. Kristoff doesn’t appreciate being brow-beaten by the plucky princess but agrees to help Anna find her sister because he’ll be out a job if summer isn’t restored. Also joining the search party is Olaf the Snowman (Josh Gad), an enchanted creature borne of Elsa’s tantrum who “loves warm hugs” and hopes to one day live in the tropics. “Someone’s got to tell him,” says Kristoff, giving voice to our knowledge that Olaf would only melt away if subjected to warmer temps. Just like Frosty. Olaf’s penchant for palm trees becomes a running gag, as does his vegetable nose, which is at constant risk of becoming lunch for Sven. 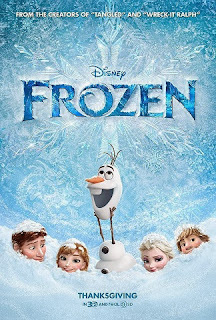 Anna, Kristoff, and their goofy companions track Elsa to the crystal castle she’s constructed on a lofty mountain, but the ice queen wants nothing to do with them. Unable to control her powers, the transformed Elsa has taken to wearing gloves (like the X-MEN’s Rogue) and literally built up walls to keep out those who ostracized her. Convinced she’ll only cause further harm to Anna and Arendale, she has a burly snow monster chase the interlopers from her snowy retreat while she fends off other invaders with brilliant blue-and-white blasts from her icy fingers. Alarmed, Prince Hans dispatches his best men to rescue Anna and detain Elsa, if they can. The confrontation rattles Anna, who sustains another cold-related injury requiring a bit of TLC from the Troll King (Ciaran Hinds) and his minions, who are only too happy to oblige. But Anna knows she must still find a way to warm her ostracized sister’s heart and bring back the sunny seasons, lest the entire kingdom fall victim to hypothermia. Directed by former animator Chris Buck (TARZAN, SURF’S UP), FROZEN is a delightful, humorous, and yes—heartwarming—family flick that celebrates sisterhood (and the need for sacrifice) while toying with the tropes of more conventional adolescent rom-coms. We’re introduced to two maidens and two potential suitors, and just when you think you’ve figured out which gal will end up with what guy, the writers throw in a clever twist. The “Snow Queen” of yore was a bona fide villain. Here, Elsa is merely a misunderstood mutant who can’t help but turn a cold shoulder when her emotions get the best of her. FROZEN’s true adversary is a phantom menace, an underhanded baddy who manipulates the sisters in an effort to wrest the castle and its spoils from Arendale. The voice actors do a terrific job inhabiting their characters, reading the lines, hitting the comedic marks, and singing the many musical numbers. Menzel and Bell are especially good, the former having experience on Broadway in WICKED and Bell as Becky Thatcher in a theatrical production of TOM SAWYER. Each has a solo spotlight (Menzel shines on “Let It Go”), but their “For the First Time in Forever” duet serves as the flick’s theme. Other cues are more funny than grandiose, with Groff’s bumbling mountain man singing how reindeer are better than people and the trolls playing matchmaker with the funny “Fixer-Upper.” Canadian composer Christophe Beck (GARFIELD, THE HANGOVER) turns in a score worthy of the Disney name, a cinematic soundscape whose woodwinds and brass befit an adventure in cold climes. If you and the tots enjoyed TANGLED, you’ll flip for FROZEN. It’s another surefire holiday hit for the House of Mouse.